One of the major talking points over this weekend’s Africa Cup on Nations 2012 qualification matches were the crazy scenes that overcame the South African side, and in fact the whole country, after their draw with Sierra Leone on Saturday. Seemingly no one in South Africa realised that goal difference was not the deciding factor for qualification to AFCON 2012 in Equatorial Guinea, but in fact head-to-head results between the top three teams in the group did in fact mean that South Africa had failed to qualify. Their 0-0 drawÂ with Sierra Leone left South Africa tied with Niger and Sierra Leone, and ahead on goal difference but not on head-to-heads. ThisÂ humongousÂ error infiltrated the whole country. CoachÂ Pitso Mosimane admitted he had played for a point against Sierra Leone instead of the win Bafana Bafana needed. Whilst at the final whistle, the players celebrated on the pitch for a number of minutes, went through a lap of honour and the state-run African Broadcasting Corporation proclaimed qualification, both of which can be seen on the video below. Even,Â South African Football Association president Kirsten Nematandani went on television to congratulate the team and Bafana Bafana midfielder Steven Pienaar expressed his delight on Twitter. 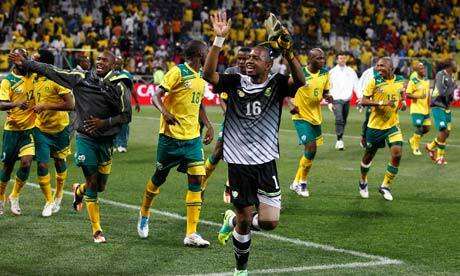 South Africa’s massive FAIL, of players celebrating and ABC announcing qualification, can be seen here.